We are thrilled to announce that we have signed a North/South American Distribution deal with Nth Ascension, one of the finest Prog-Metal bands to come out of the UK in years! 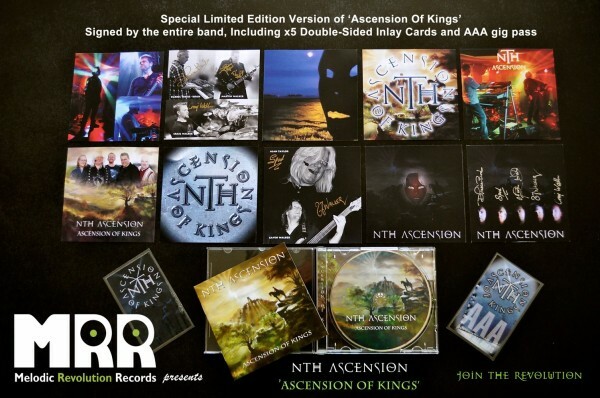 Nth Ascension was conceived of in 2009 by Darrel Treece-Birch (Ten Keyboardist) with his friend Craig Walker after the two had performed in a Charity gig. By January 2010 Treece-Birch’s long-time friends and writing partners had joined – Alan “Spud” Taylor and Martin Walker and in 2012 Gavin Walker joined to round out this five (5) piece powerhouse. In 2011 the demo, ‘Frequencies Of Day & Night’ was recorded and issued as a free download via Aurovine. By 2013 the band had begun sessions to develop the songs which would become ‘Ascension Of Kings’ which was released in December of 2014 via their UK label Sonic Vista Records. Ascension of Kings features 8 powerful and majestic tracks clocking in at just under 57 minutes. 1. Ascension Of Kings CD signed by the entire band. 2. Five all new designed, double-sided CD inlay cards. Ascension Of Kings, is not a concept album, but has a clear and distinct theme. There is a three-part suite within the album entitled ‘Clanaan Chronicles’ which will continue in subsequent albums and follows a story written by Treece-Birch in the vein of Narnia/Lord of The Rings which see the rescue/redemption of a tortured realm by the Seventh Rider, from an evil dictator; leading ultimately to the ‘ascension’ of the Seventh Rider to the prophesied King. There is a spiritual element to ‘Ascension Of Kings’ providing a cohesive structural element to the powerful and compelling music. Strange Dreams has a ‘Matrix’ type theme to the lyric, whilst Vision tells the story of Moses vs Rameses from the perspective of a slave. Weight Of The World grips the listener with the story of desperation and fear that can cripple the soul but how that burden can be lifted through each other and true friendship. This is truly a collaborative group of musicians, each member a gifted songwriter in their own right, their individual “bare-bones” ideas are brought to the table for refinement and development by the entire band; resulting in an explosion of sound and lyric magnificence all borne of the natural flow of the creative effort of the collective. Vocals Recorded by Gary Hughes (TEN) April/May 2014. Drums were recorded at Berlin Studios Blackpool in 2013, at RW Studios in Rossall and at The War Room studio in Cleveleys from November 2013 to March 2014. Mixed by Martin Walker and Nth Ascension. Mastered at Digital Audio in Skipton, UK. Artwork was commissioned from UK artist Oliver Pengilley.